On January 29, 2011, five Forbush Members competed with 20 other teams in the Superbowl of Birding VII organized by the Audubon's Joppa Flats. This is a team contest to record the most points (points are dependent on rarity of species observed) and species from 5 am to 5 pm. The contest area consists of Essex County in Massachusetts and Rockingham County in New Hampshire. At the end of the day, the Burger Kinglets, made up of Paul Meleski, Rodney Jenkins, Tom Pirro, Chuck Caron and Dan Berard, were awarded the top prize, the Joppa Cup, given to the team with the most points. This competition features some of the best birders around and these guys did a great job. Great field ID skills, strategy and a little luck are needed. Congratulations. For a detailed description of the day, see Tom's Blog. The 77th Annual Dinner and Business Meeting of the Forbush Bird Club was held at the Manor Restaurant on Route 12 in West Boylston, MA. "Birders", "Massachusetts Wildlife", and "Looking Skyward, a Passion for Hawkwatching". John Van de Graaff was the featured speaker, who gave a very enjoyable slide show presentation entitled "Birds across Europe: A photographic odyssey". If you'd like to see more of his photos, here is John's website. 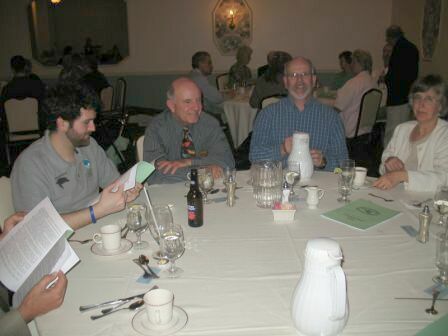 The 76th Annual Dinner and Business Meeting of the Forbush Bird Club was held at the Manor Restaurant on Route 12 in West Boylston, MA. The dinner speaker was Blair Nikula, who spoke on "Penguins, Petrels, and Prions: An Antarctic Adventure"